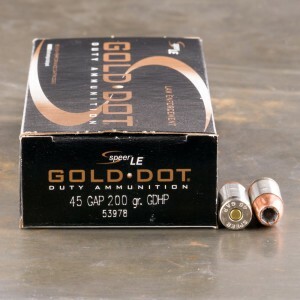 .45 GAP ammo (GAP is an acronym for Glock Automatic Pistol) is a rimless, straight-walled, .451 caliber, pistol cartridge developed by CCI/Speer engineer Ernest Durham at the request of firearms manufacturer Glock for use in their model 37 semi-automatic pistol in order to create a pistol cartridge that equaled the power of the .45 A.C.P. (Automatic Colt Pistol) but which could be fired from a 9mm sized handgun. 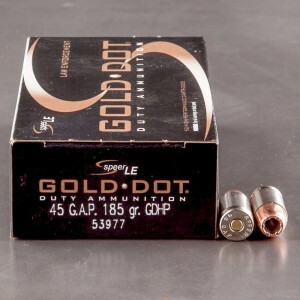 45 GAP ammunition was the first commercially produced cartridge to be associated with Glock, the design concept of equal power from a reduced capacity case was achieved by strengthening the web of the case to prevent blowouts and carefully selecting a modern powder in order to create a cartridge with an internal chamber pressure roughly equal to that of .45 ACP +P loads. 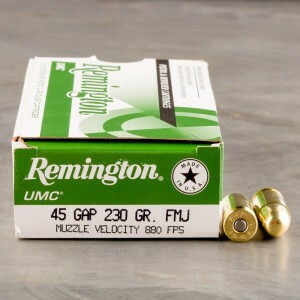 fired two mags of this ammo with NO issues at all. 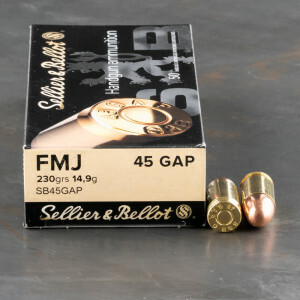 Gap is impossible to find on the shelves so I thought I would try ammo to go. very fast delivery and a good price. glad I found this site. 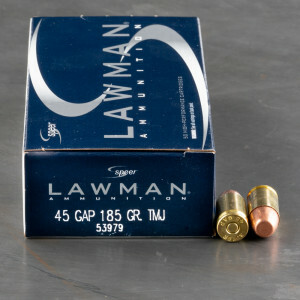 This ammo shoots about 1.5" groups at 15 to 20 yards in my XD Le. Thanks for carrying this load and prompt delivery. 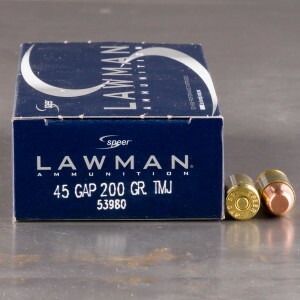 Several months ago I got several boxes of this ammo and the same load in 50 rnd boxes. This is great ammo. Quarter size groups are common at 20 yds from my XD45Le bi-tone. Thank you for the good service and fast shipping.